While I was at the Museum of Witchcraft and Magic's conference earlier this year I bought a big pile of books at the Troy Books stand. I finally found time to begin reading them and started with Spells from the Wise Woman's Cottage: An Introduction to West Country Cunning Tradition by Steve Patterson. It is an absolute delight. 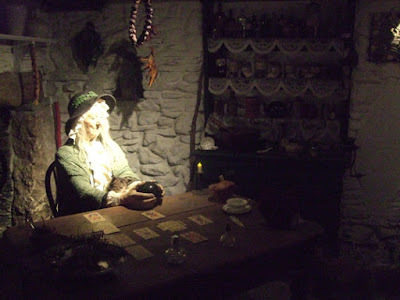 The Wise Woman's Cottage is a tableau at the heart of Boscastle's Museum of Witchcraft. As you can see in the photo above, which I took back in 2012, it shows a kind-looking woman in 19th century attire divining with a crystal ball. Around her, in her modest stone cottage, are the tools of the trade associated with a white witch - often called a "peller" in Cornwall and the West Country. As you observe the scene at the museum, you can hear an audio recording of traditional charms as they might have been recited to someone visiting the wise woman for magical aid. They include spells for love, healing, blessings and protection. I must admit that on the two occasions I visited the museum I spent less time at this scene than I would have done if I had read Spells from the Wise Woman's Cottage first. What the book does is explain the tableau, the items in it, the spells on the audio track, its history within the museum and tales of four wise women who inspired it. One of the accounts is of Joan Wytte, known as the "Fighting Fairy Woman of Bodmin", who may or may not have been a real person and whose story I had previously heard at a talk by folklorist Dr Helen Cornish. You can read that here. 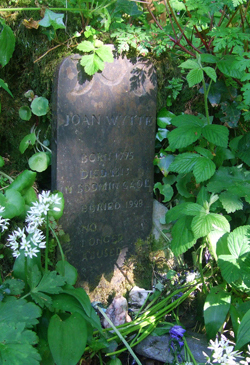 Joan's grave can also be found just up the river from the Museum of Witchcraft and I visited while I was there this spring. With Joan being in many ways a patron spirit of the museum, it is not surprising that the figure in the tableau is also called by that name. Spells from the Wise Woman's Cottage is fascinating - and also pitched at the right level so that knowledgeable witches and complete novices can enjoy it and learn from it. If you are planning on visiting the Museum of Witchcraft and Magic or have gone there in the past, do read this book. If you have never been and are never likely to, but have an interest in the history of cunning folk and wise women, read this book too. You will love it. You can view Spells from the Wise Woman's Cottage on Amazon.